Sorry... the 2017 Nissan Juke is no longer being sold as new. The 2017 Nissan Juke is a subcompact crossover that seats 5 passengers. It competes with the Mazda CX-3, MINI Countryman, and Honda HR-V. This year, it remains largely unchanged. However, a new Black Pearl Edition package is available as well as the Stinger Edition packages from last year. Five different trims are available: the S, SV, SL, NISMO and NISMO RS. The Black Pearl Edition package costs an additional $1,190 on top of the SV trim’s MSRP of $22,550. The Juke continues to maintain its strange appearance. It has rally-inspired headlights, muscular body styling, uniquely placed turn-signal indicators at the hood, and 17-inch alloy wheels. The NISMO and NISMO RS come with sportier styling, sport-tuned suspension, a rear spoiler, and larger 18-inch alloy wheels. The Color Studio program returns, allowing owners to choose their own accent colors for the side mirrors, headlights, front and rear bumpers, etc. As implied, the Black Pearl Edition comes with black pearlescent exterior paint, white accents on the front and rear bumpers, white-cap side mirrors, a white rear spoiler, and special badging. Under the hood, the Juke is powered by a standard 188-hp, turbocharged 1.6-liter four-cylinder engine mated to a continuously variable transmission (CVT). Front-wheel drive is standard (FWD), while all-wheel drive (AWD) is optional for all models. A six-speed manual transmission (6MT) is available for the FWD NISMO and NISMO RS trims only. The NISMO RS is tuned to produce 211-hp with the 6MT and 215-hp with the CVT. Fuel economy for the FWD Juke is an EPA-estimated 28/32 mpg city/highway, while the AWD Juke has a slightly lower rating of 26/30 mpg. The NISMO with the 6MT/FWD layout improves the rating back up to 27/33 mpg. The NISMO RS has lowest ratings of 25/29 mpg (CVT) and 26/31 mpg (6MT). Inside, the five-seat Juke has numerous standard features that give it great value for the money – starting MSRP is slightly over $20,000. They include push-button start, a USB port, Bluetooth connectivity, air conditioning, cruise control, and power windows/locks. Between the two front seats are cup holders and storage compartments. Optional features include leather upholstery, navigation, a Rockford Fosgate premium audio system, and heated front seats. The Black Pearl Edition has unique black cloth seating with white stitching and a white-trim for the door inserts and center console. 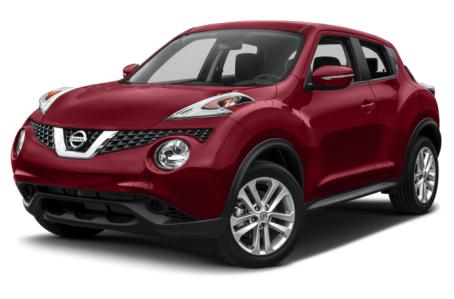 For safety, the Juke has a backup camera, six airbags, anti-lock brakes, and an electronic stability system, which are all standard.